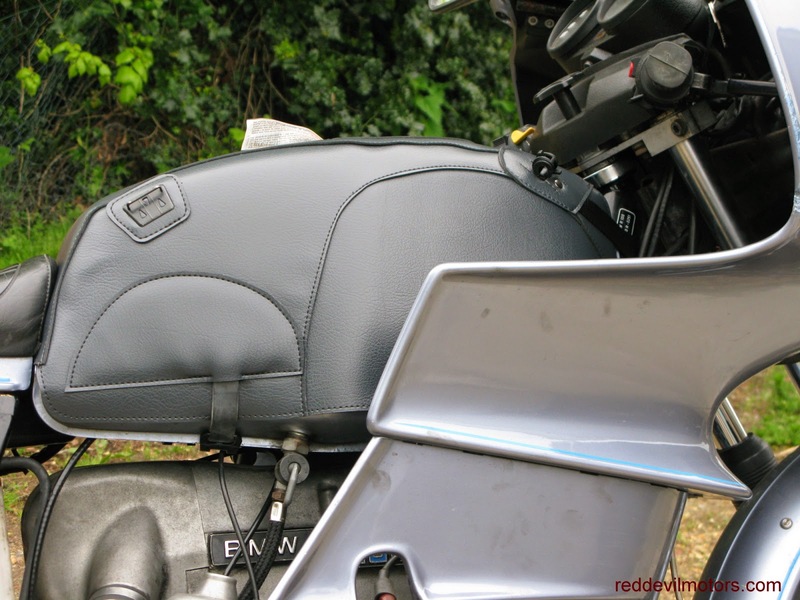 The latest step in re-invigorating the Beemer R100RS to grand tourer par excellence status is a Baglux tank cover. I'm over the days of fitting a magnetic tank bag that picks up any stray swarf from around the shed and then scours your pride and joy's paintjob. The Baglux is a neat system, a made to measure tank cover specific to your bike and then a choice of tank bags to clip on and off. I ordered from Motorcycle Heaven on the sole basis that they were one of the few who listed the cover for BMW airheads and the price was keen. A tip for anyone else ordering - if you buy the cover first they send you a 10% off voucher that you can then use against the tank bag. Postage is free on both. To save everyone time and money you might as well get in touch, request the discount and buy both together. The cover is made to order so the lead time was about three weeks. Fit on the cover is excellent. I ordered it in 'anthracite' which I have always pictured as very dark grey. Baglux's version of anthracite is a grey blue. In other circumstances I might have sent it back but by good fortune it compliments the 100RS's light blue colour scheme pretty well. 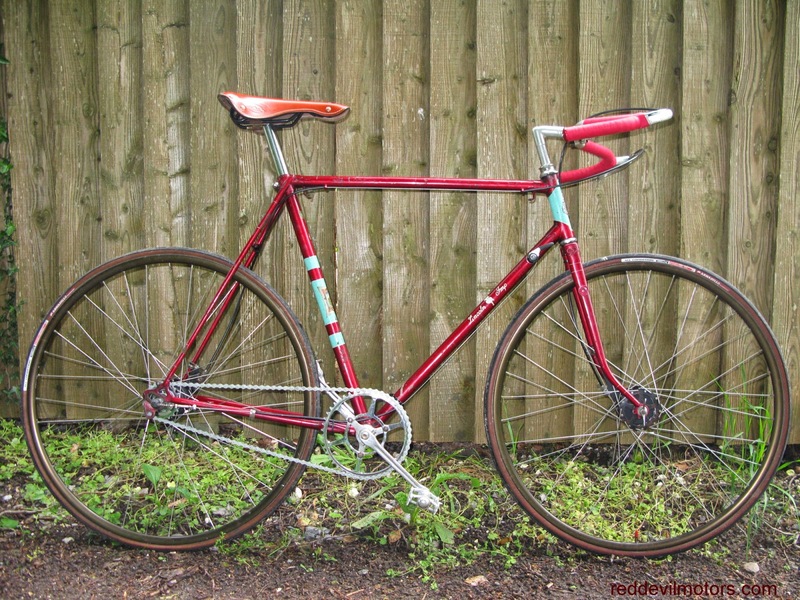 Nearly all ready now for a trip to Chimay for the Classic races next month. BMW R100RS Baglux tank cover. You've got to assume that 'Poodle' was the Enfield's nickname rather than the rider's. Either way a smartly turned out Ensign replete with the full gamut of period accessories; panniers, frame and rack, legshields and windshield with skirt. This came to me as a cutting, I've no idea of the original publication. No problems identifying the bike, not many shout the marque quite so loud as this Fafnir. Fafnir was a German manufacturer, I cannot quite identify the year of the machine though 1905 would be a pretty good guess. 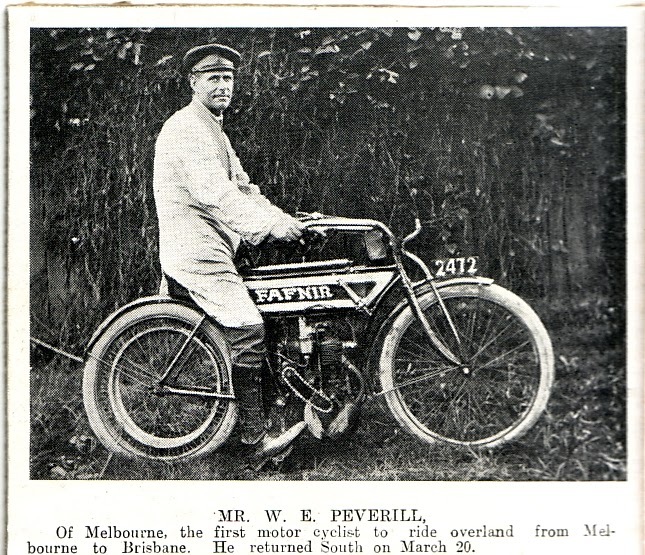 More interesting though is the caption, 'Mr W E Peverill of Melbourne, the first motor cyclist to ride overland from Melbourne to Brisbane. He returned South on March 20.' No doubt a major expedition of a journey back in the day. I've had a trawl through the web and cannot find any other reference to this journey but Mr Peverill did not stop with this one ride, he later became a regular in Australian long distance records and reliability trials. W E Peverill and his record-breaking Fafnir. 'WE Peverill lived in Nolan St, Maryborough, about 100 miles outside Melbourne. Keilor and Gisborne are townships about 22 miles apart on the Melbourne-Maryborough road so were familiar to Mr Peverill. 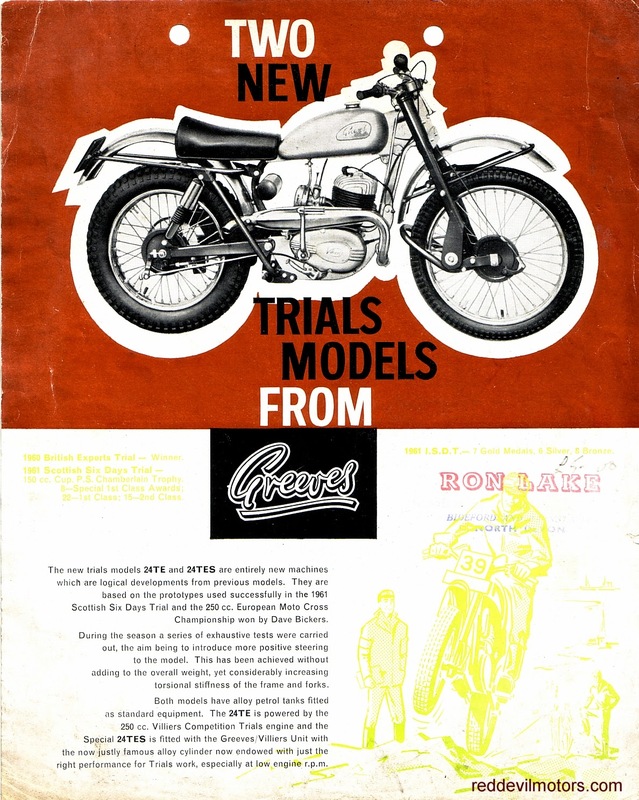 Brochure for the 1962 Greeves trials models 24TE and 24TES. The TE had an iron barrel and the TES was fitted with Greeves' own alloy barrel and head. 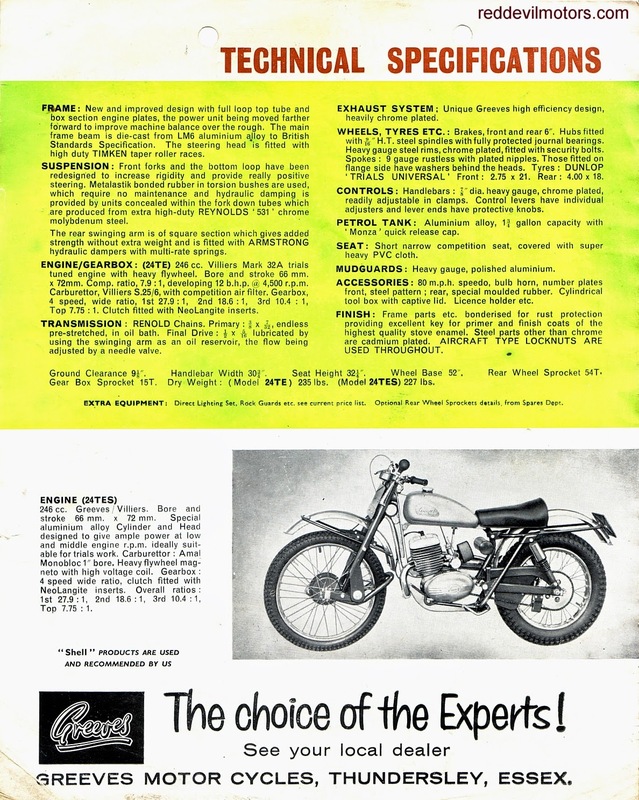 The bikes were popularly known as 'Scottish' models though there is no mention of that name on the brochure. 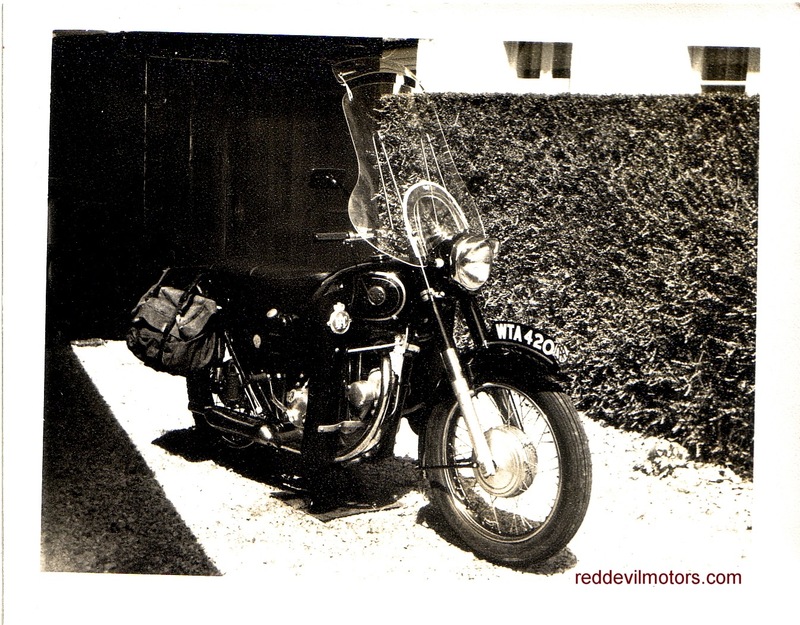 The engine was the Villiers 32A 250cc, there was also a 20TE iron barrel model fitted with the Villiers 197cc 9E motor. Greeves Scottish brochure page 1. Greeves Scottish brochure page 2. Bugatti T72 attached to a period Peugeot cycle. Ettore Bugatti moved to Paris in 1936 after handing over the reigns of his factory in Molsheim to his son, Jean, following an industrial dispute which had left him slightly embittered. During this time Ettore designed several new engines, a common theme among which was jewel like precision, miniaturisation and an level of sophistication in utilitarian objects that would have resulted in the products being impossibly expensive. One of these motors was the T72 cyclemotor which was more than likely designed in the early years of the war with an eye on the post war market. There were two iterations of the design, the T72 and T72B with some significant changes seen on the later development. It is believed that some seven engines were actually produced of which there seem to be three survivors each of which is a T72. Close up of the Bugatti T72. The specification of the T72 is rather outrageous for a cyclemotor: twin overhead cams and supercharger. The T72 had a capacity of 10.6cc which may seem miserly but with a calculated maximum rpm of 15,000 a cruising speed of 30mph should be easily attainable slightly further down the rev range. The later T72B had an increased bore giving a capacity of 12.6cc. Just a look at the T72 design suggests that at the revs it was required to produce and in the position it sat on the cycle it would be likely to suffer from overheating problems. 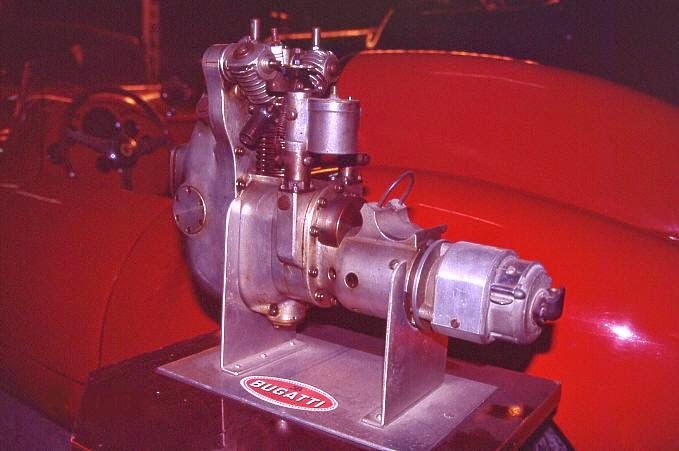 The T72B was turned around 90 degrees and the crank sat in line with the cycle suggesting that overheating was a problem recognised by Bugatti in his mark two variant. There appear to be no existent pictures of a Bugatti cycle attachment in motion and non of the survivors are running. What a pity as seeing and hearing one in motion would be a wonderful thing. Much of the information above has been garnered from The Bugatti Revue and The Moped Archive and the pictures are taken from The Bugatti Revue. 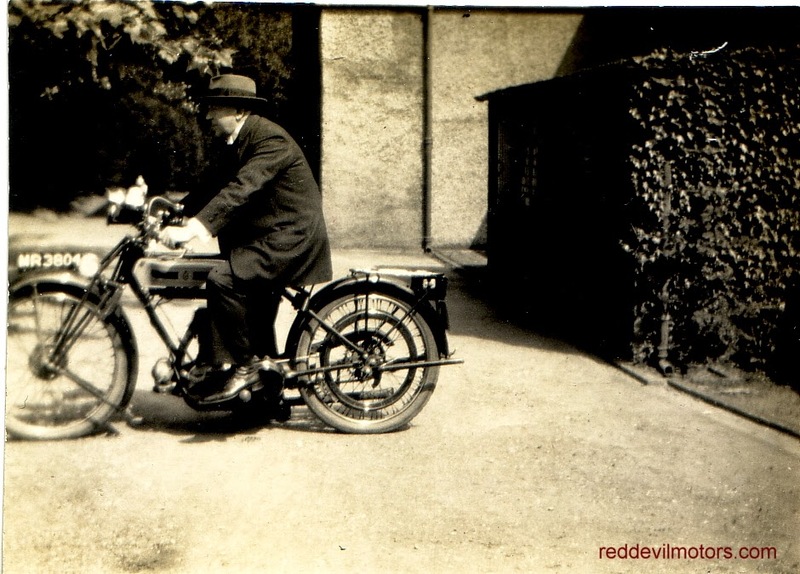 Several photos of the same Model P Triumph taken at different times. The same dapper gent astride the machine in each image modelling a fine line in hats. 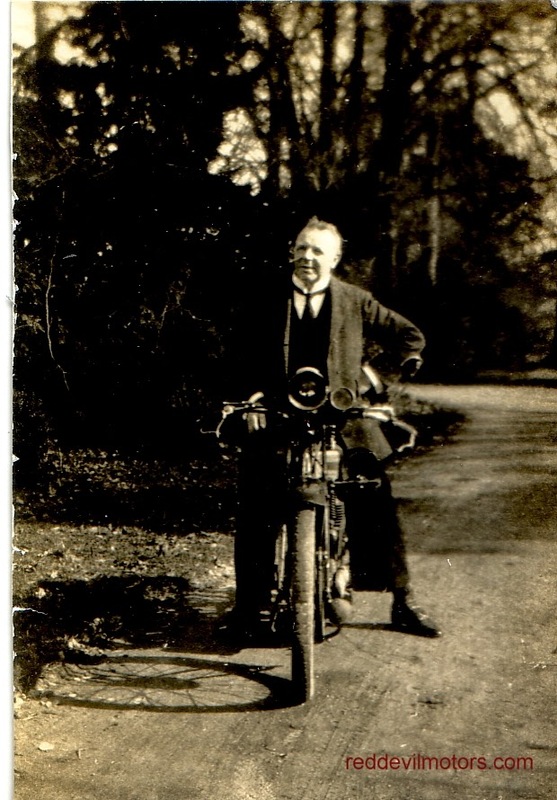 The Model P was Britain's two-wheeled Ford T in that it was a decent quality product sold at a price significantly below that of its competitors. By the time production had finished in 1927 somewhere around 55,000 Model Ps had left the Triumph factory gates. 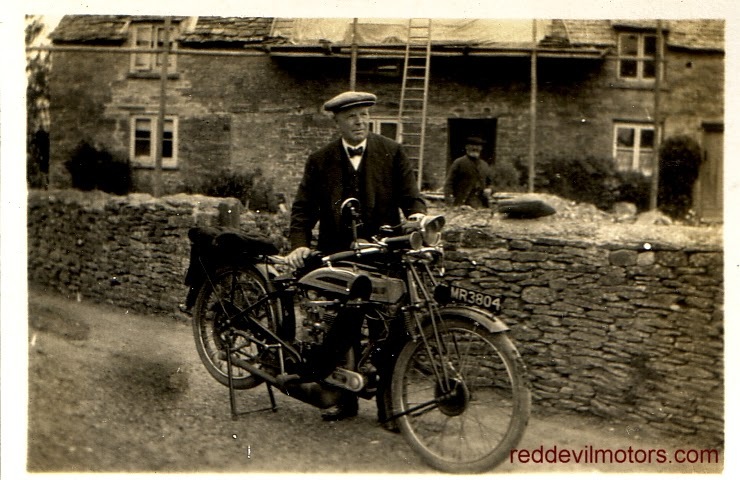 More on the P at VMCC Marque Specialist Peter Cornelius' Pre-War Triumph pages. 1926 or perhaps 1927 Triumph Model P.
The Model P has gained a pair of legshields. Photo not quite on target, got most of the bike in though. This time a natty trilby for headgear. 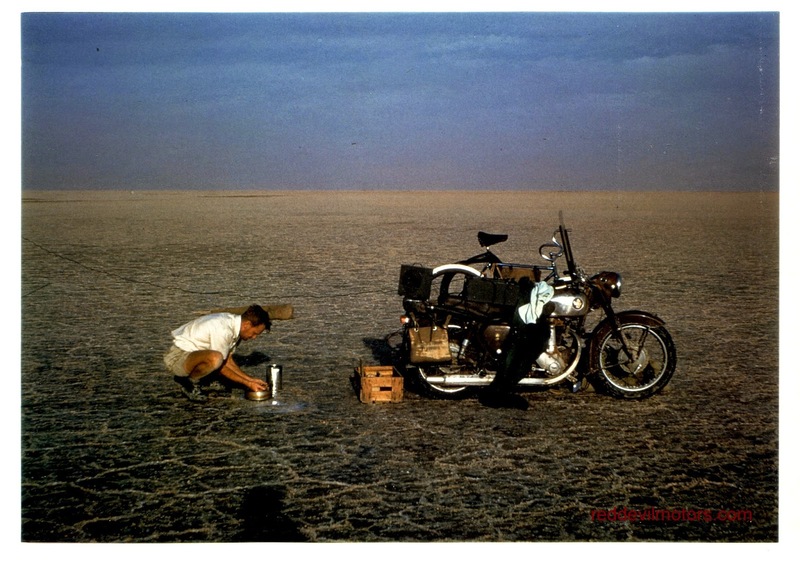 A pair of pictures seemingly from an expedition in the late fifties. 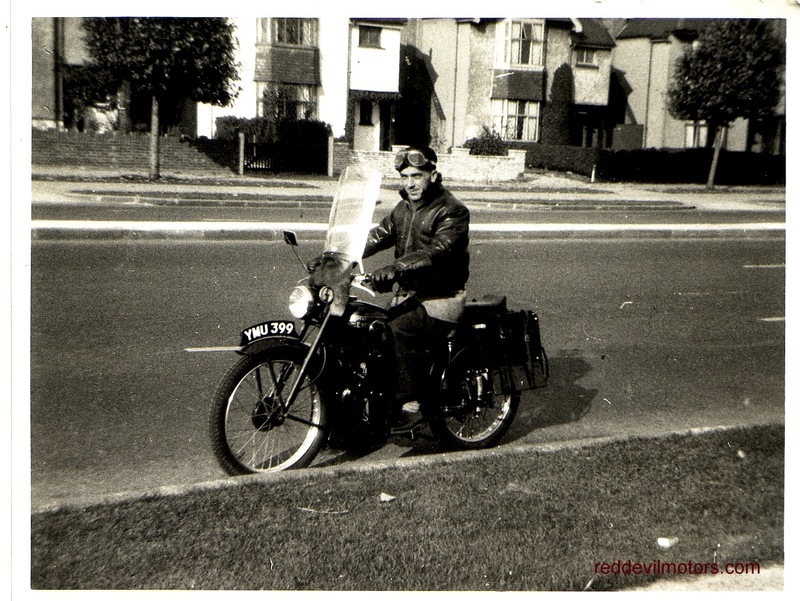 The bike is a 1956 or 57 BSA B31 and the pictures were enlarged in 1961 so the date has to be somewhere in between these. 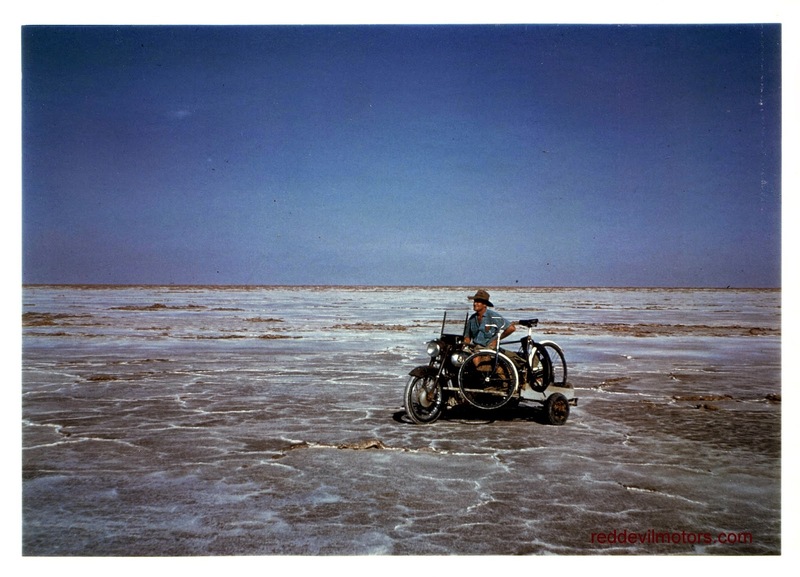 As for location it's obviously a salt pan but where? I would guess Southern Africa, maybe the Kalahari, though it could be Australia. The combo is rather strangely loaded, there were evidently two travellers but there's not a lot of room for them on the machine, not a lot of luggage and they are carrying a slightly forlorn looking bicycle. If anyone knows more please get in touch or comment. 1956 / 7 BSA B31 with sidecar on tour. BSA B31 combo cruising the desert. 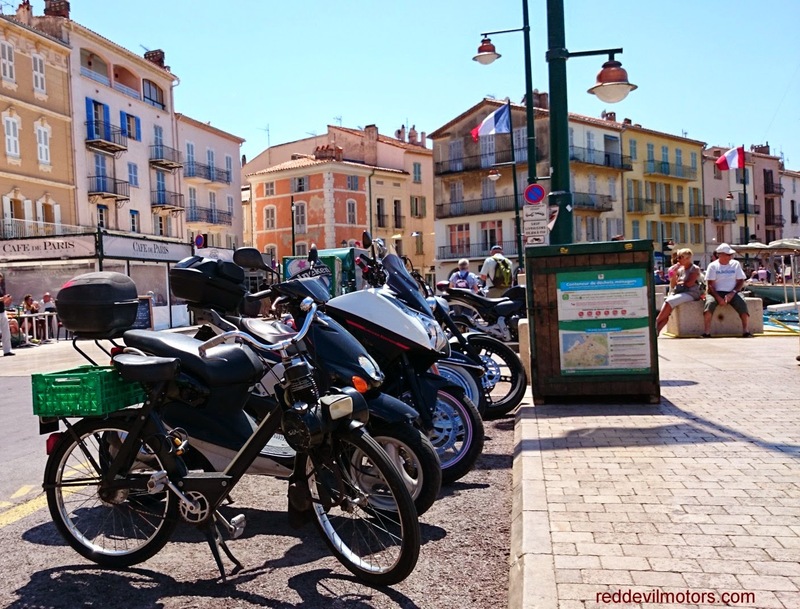 We were down in the South of France for a family holiday recently and had a day out in St Tropez. Plenty of bikes there, loads of swanky super scoots, guys expressing their individualism through buying identikit Harleys and the occasional formulised brat style Triumph Bonneville. The stand alone machine though was this Velosolex with plastic crate on the back. I like to think that it is owned by some uber-dude who has transcended motorcycle fashion and come out the other side riding this beast but it could also belong to an old duffer who has had it since new. The great thing is it doesn't matter, this steed costs a fraction of the price of those around it and oozes an attitude that is to be cherished. The baddest bike in St Tropez. 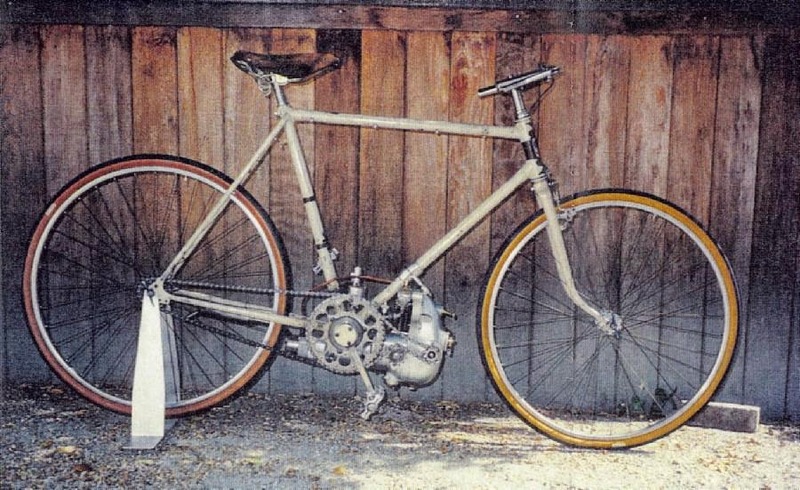 Velosolex. This flyer was originally an advertising supplement to 'The Motor Cycle' magazine back in 1911. 65 miles in one hour is a rather impressive speed for a veteran 500cc single speeder. Also impressive in my mind is the fact that back before the 1st World War a record was broken 3rd October, a flyer then immediately designed and printed. The flyer was then inserted into a magazine which reached shops across the country just two days later on the 5th in the morning. 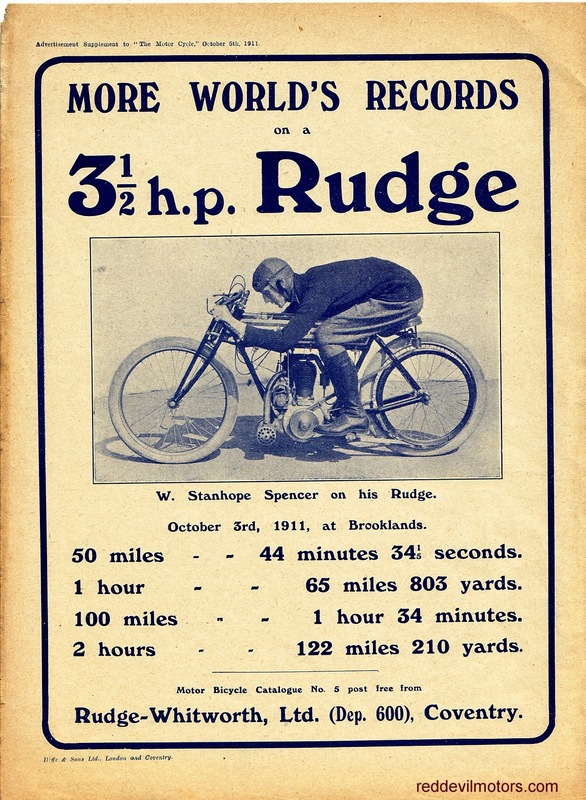 Breaking world records on a Rudge in 1911. 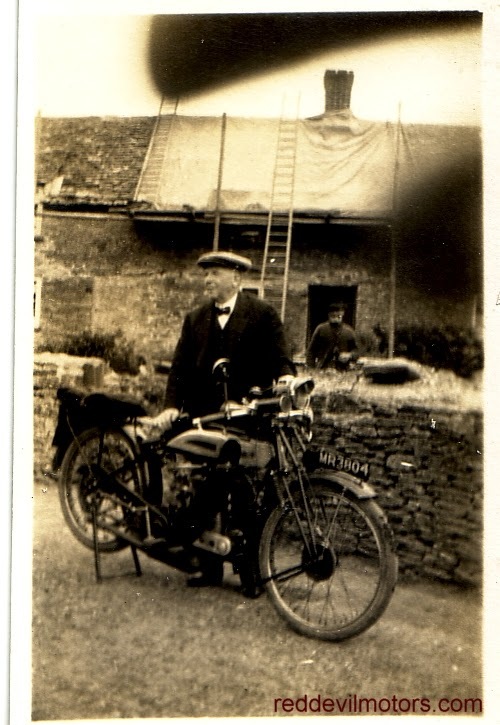 Period photo of a fully kitted out AJS, a 16MS if I'm not mistaken. Set up for touring with legshields, saddlebags and enormous screen plus the precaution of RAC membership! 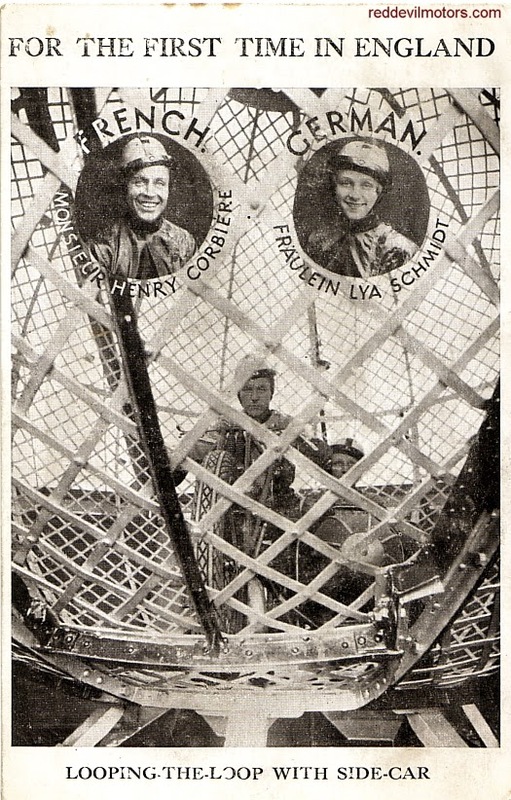 Souvenir postcard from a 'Globe of Death' stunt show. Looks like it is from the thirties. Using a sidecar in the globe is something a bit different and I can't find reference to it elsewhere, a French and German team seems like less of a unique selling point these days though. 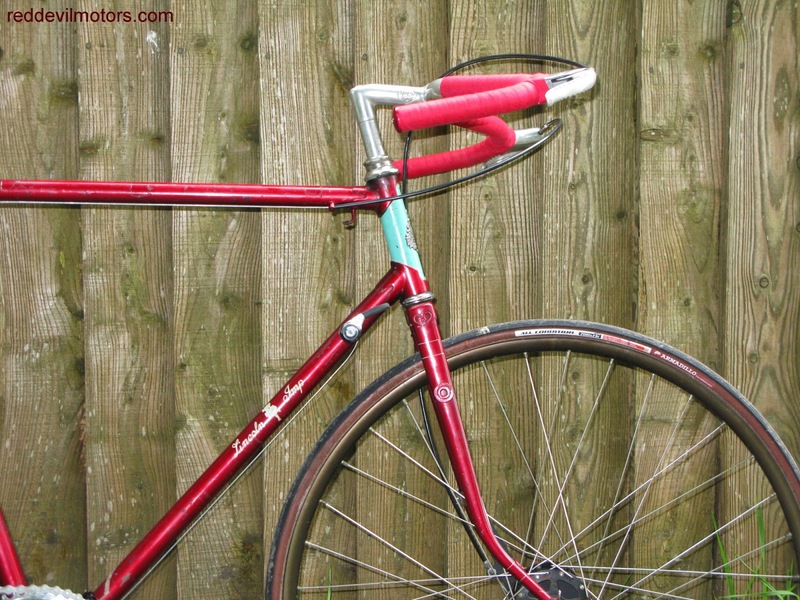 The Globe of Death shows used to be more common, I saw one once a few years ago at a bike show in London's Docklands. The Globe is spectacular but loses out to the Wall of Death in the fact that it is hard to hide from punters. It's quite easy to line folks up and sell them a ticket in to the Wall show, but try hiding the Globe of Death! The Lincoln Imp is finally ready for action. The build threw up a few challenges and resulted in some last minute swapping around of components but the end result looks a whole and right so you can't ask for much more. Since the last post on the build the Imp has lost all the components that we proving tricky to fit and gained a set of Sturmey Archer Steelite hub wheels. These wheels were robbed from the Jack Hearne cycle I have but in turn the 27" wheels and Mafac brakes that were planned for the Imp fitted the Hearne a treat so it seemed like the right thing to do. The Imp had been proving very difficult to fit a more recent gearset to. The Campag Nuovo Record rear mech had to be subjected to some judicious filing to get it to fit, the Mafac brakes were lacking in reach at the rear and the final straw was that the Campag gear lever proved to be impossible to fit on to the Benelux braze-on without some serious modification. Luckily I found that the new era Sturmey Archer three speed thumb shifter can be dismantled and fitted on to a derailleur lever mount. 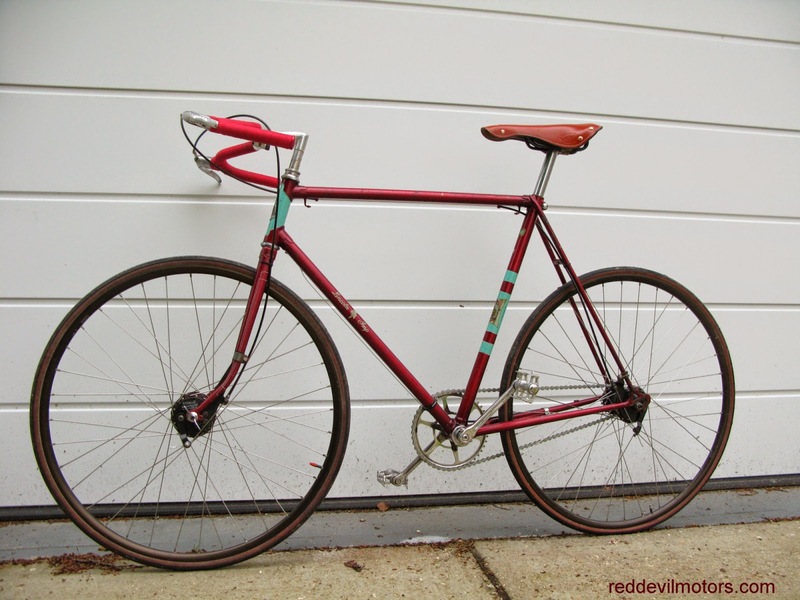 The only component left to source was a saddle. I picked up a Selle Italia retro job. It finishes off the cycle nicely. Overall very happy with the end result. The huge frame / wheel clearances caused by the drop to 700c wheels give me some aesthetic concerns but I think moving up to a more generous tyre size should sort that out. The Imp is currently on 23 width tyres and should be able to go up to 28 no problem. Time to start scouring parts for the next build. A Sun Manxman, more on that one to come. 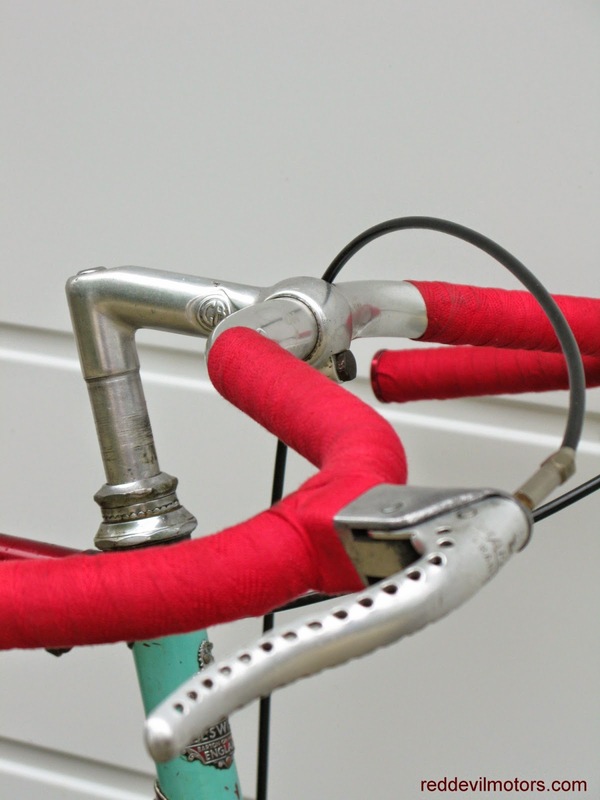 Mafac drilled levers, GB stem and moustache bars. New school Sturmey lever fits nicely onto the braze-on mount. Sturmey Steelite hub and nice pinstriping on the Imp. All its glory. The forks look bent but it's just the angle. Just need to get out and use it. 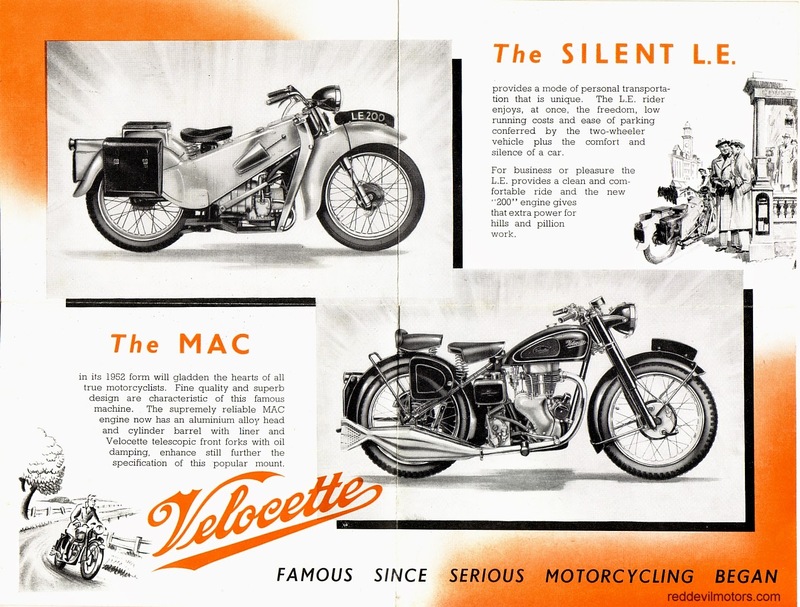 The Velocette brochure from 1952 when there were just two models in the range: the steadfast MAC which had just had its Dowty air forks replaced by Velo's own design in 1951 and a re-design of cylinder head for 1952 and the Mk II Little Engine model introduced the year before. 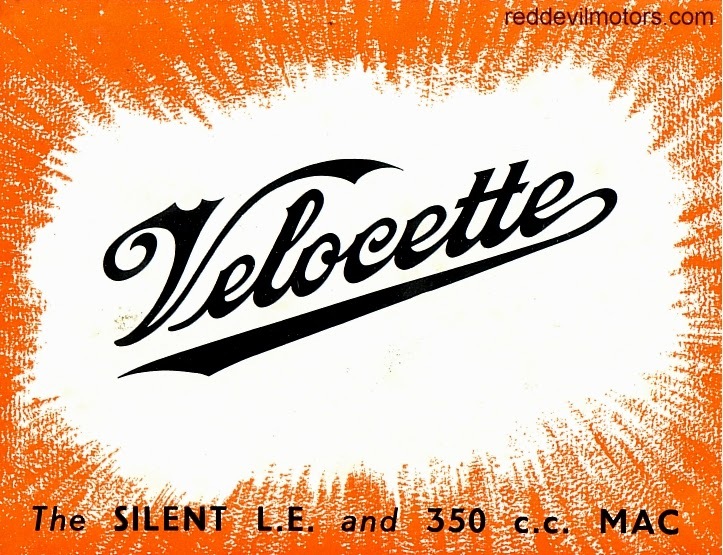 Velocette had all their hopes pinned on the LE but by 1952 reality had already dawned that it wasn't going to be the mass market seller that they had hoped for. Wonderful design though the LE may well have been the public were not particularly interested in a pricey, highly sophisticated two wheeler of very modest power. Particularly not when a BSA Bantam could perform the same duties for a lot less money..
1952 Velocette brochure front cover. 1952 Velocette brochure fold up flap. 1952 Velocette brochure fold out centre. 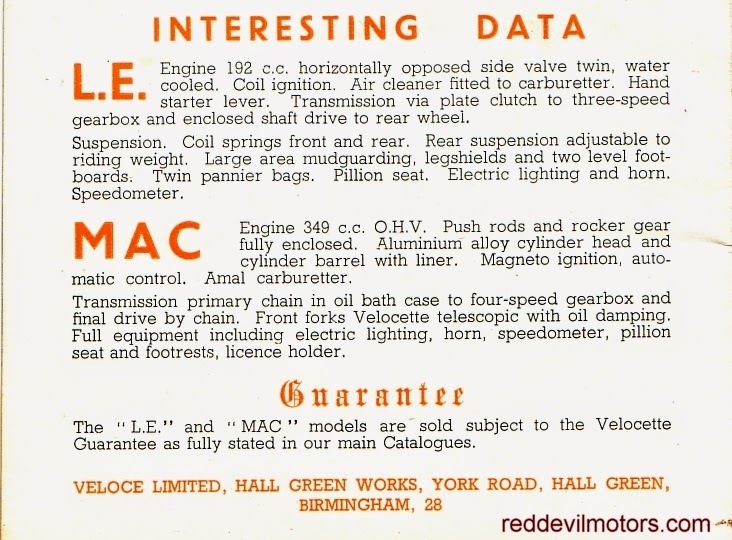 1952 Velocette brochure rear cover. Work on tarting the R100RS continues at a relaxed pace. One of the first jobs was to get a Surefoot side stand from Motobins. 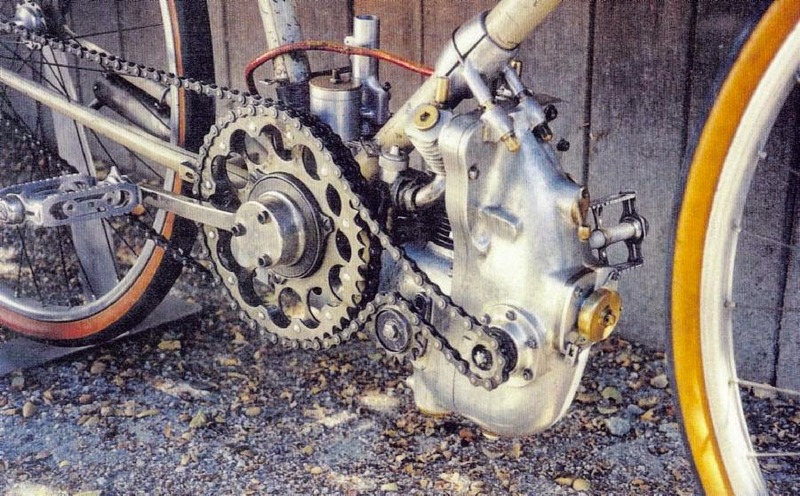 Airhead Beemers are great bikes but one thing that BMW never got right is the side stand. The o/e sprung self returning stand is a liability for moving the bike around the workshop. The stand springs up at the slightest righting movement of the bike and is in a pig of a position to reach to put back down. I was beginning to feel that it was only a matter of time before I dropped the bike and damaged the fairing. 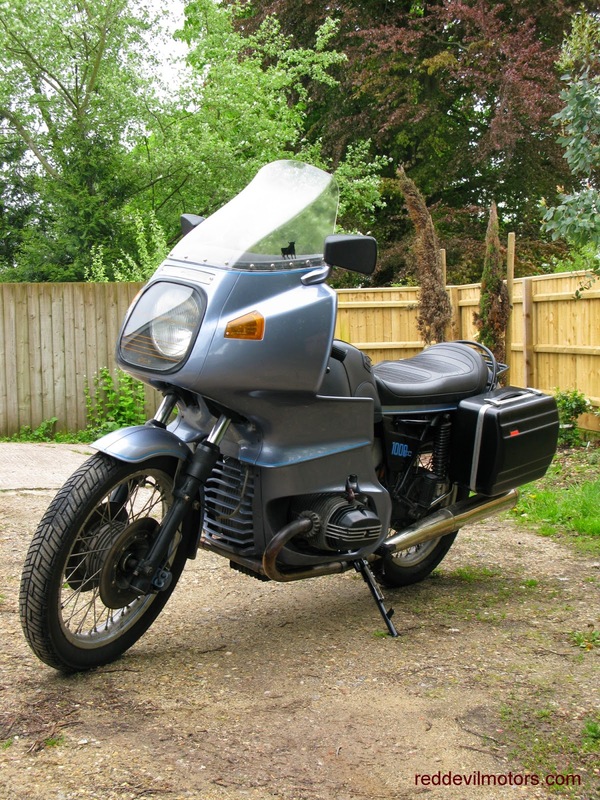 I had a Surefoot stand on my first BMW, an R65 fitted with RS fairing, so I know from experience what fine devices they are. 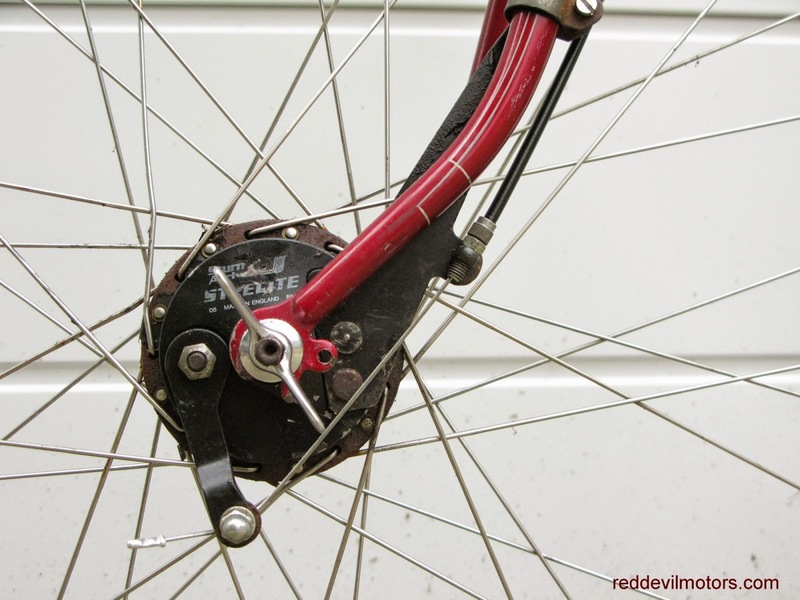 The support for the bike is rock solid and ergonomically they are in exactly the right place. 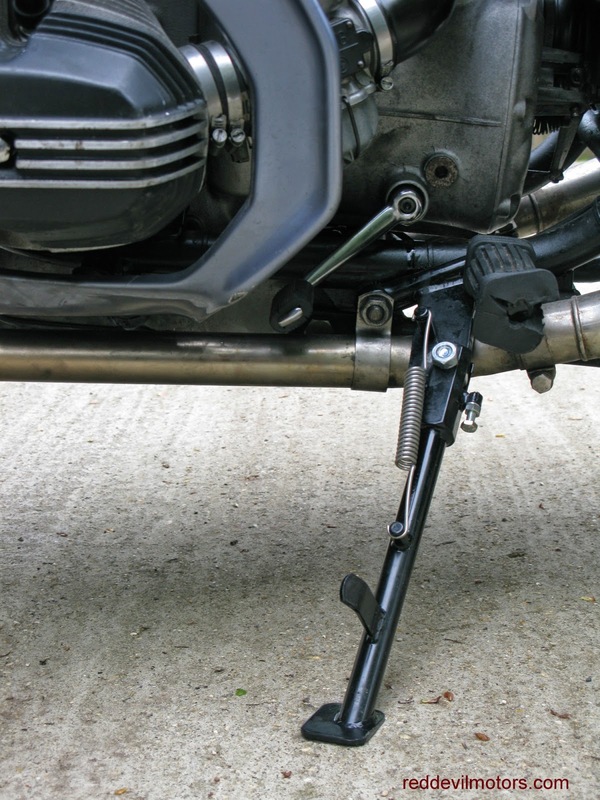 The stand bracket is integrated with the left hand riders footrest. They are offered as an exchange for your existing footrest so on ordering you need to pay a deposit for a new footrest which is returned once you send your old one in. Fitting the Surefoot is very straightforward. Removing the o/e stand less so as you need to push through one of the lower engine mount bolts to release it; I found that I had to remove the lower right hand section of the fairing to knock the bolt back home. Overall though, well worth the effort and expense, certainly a lot cheaper and easier than ending up fixing the fairing after dropping the bike. 1976 BMW R100RS fitted with Surefoot sidestand. Close up of the BMW Surefoot side stand. 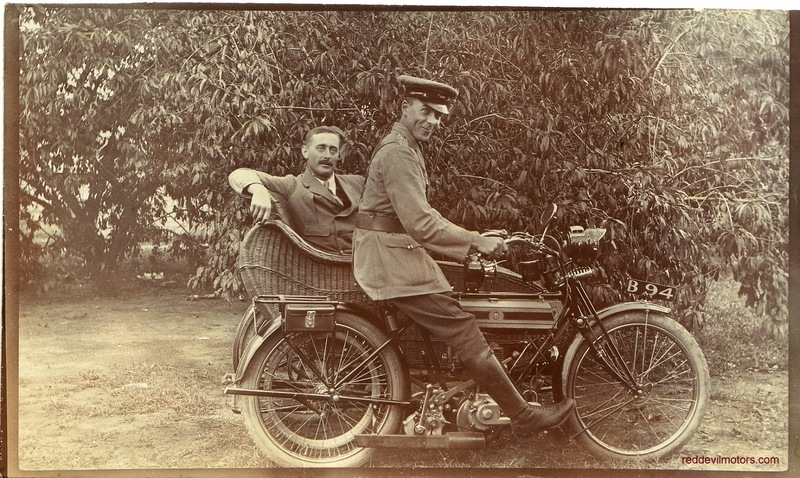 A fine detailed photo of a Model H Triumph with wicker sidecar. It came to me with the description 'Nairobi, 1st World War'. I've got no verification of this. Certainly the period looks right, one of the riders is in uniform and the background could be vaguely tropical. Whatever the case a great image. Triumph Model H with wicker chair doing service in Kenya. Some photos from a jaunt on the Norton Dommi over to the VMCC Stonehenge Whitsun Run. A cracking ride over to Drusilla's Inn with the pleasure of following behind a Series D Vincent Rapide for most of the way. Sadly not enough spare time to ride the run so just took some snaps, had a natter and waved folks off. and used as a mobile phone mast. Great to see a D1 Bantam still giving service to a learner rider. 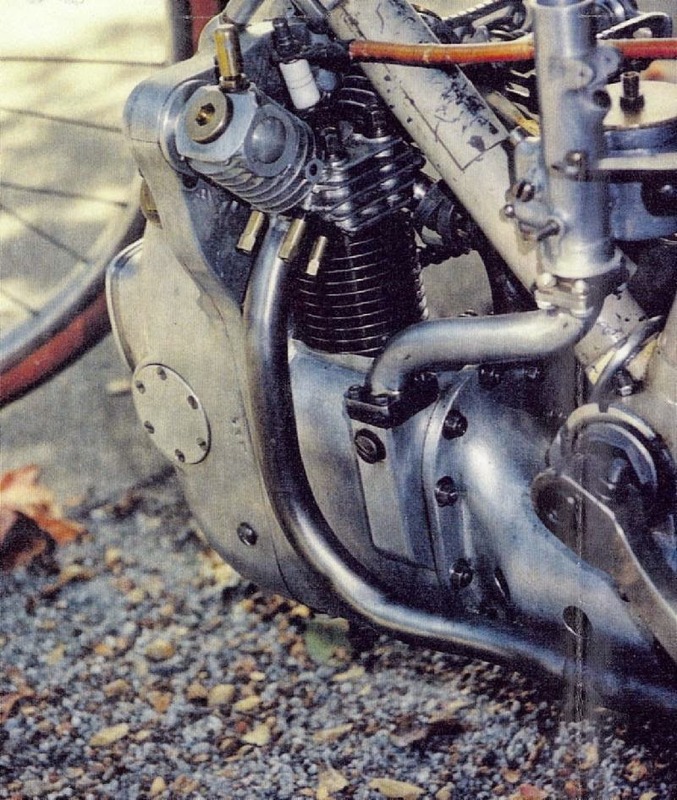 Close up of the alloy top half on the Ariel twin as above. 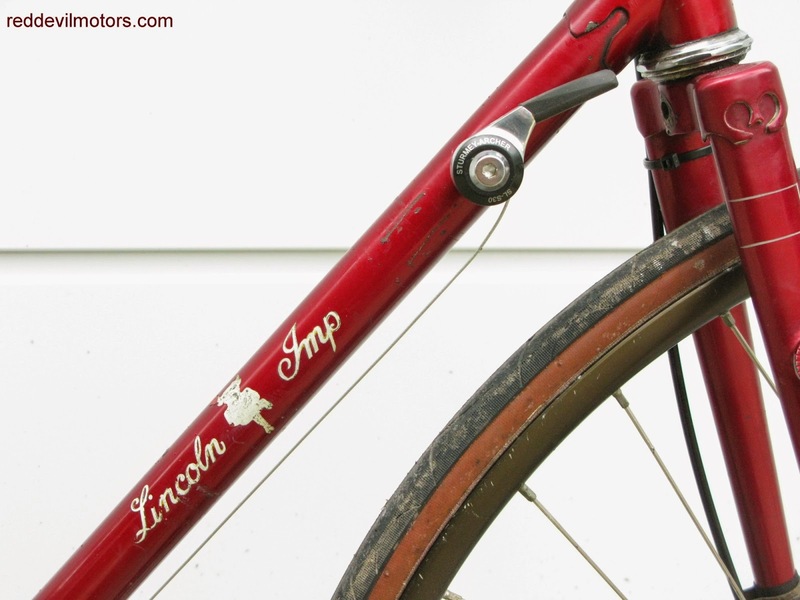 originally girder fork / rigid frame. model fitted, notably the oil and petrol tanks. and the quality of the execution is excellent. A close up of the Hinckley Triton. Last weekend saw the official re-launch of Francis Barnett. at Coventry's Motofest. There is currently one model, the Merlin. Details aren't given but from spec and appearance the Merlin seems to use the Chinese HMC 125cc platform, the same as used by Boneshaker Choppers for their Mutt. The Mutt has a more contemporary brat / flat track style whilst the Merlin goes for late fifties off road styling which to my eyes they've got bang on. Looks-wise the bike does have the feel of the original FBs, quite an achievement given that they are using a generic platform. 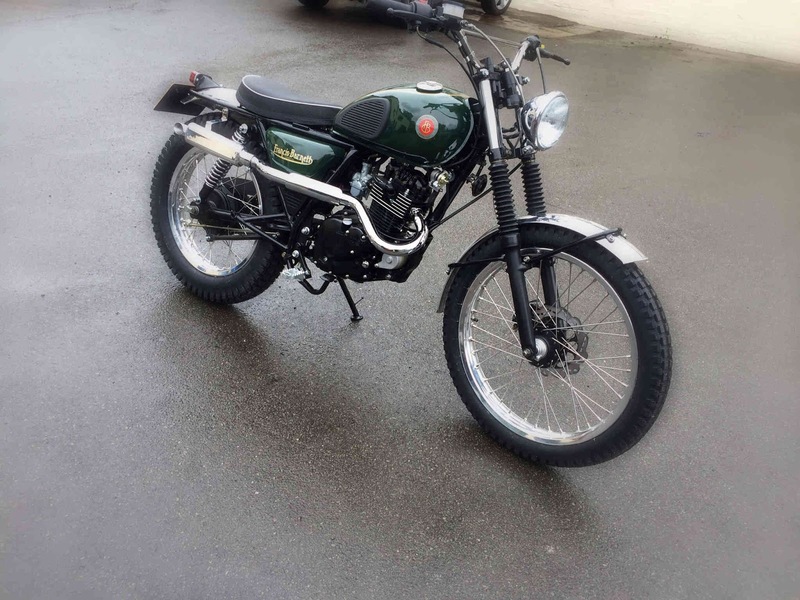 It's easy to be a hater and dismiss the bike as just another re-badged Chinese job but this is the modern world and it's simply impossible to launch a new model small bike without huge investment. The performance of the running gear is already long-proven and the style is right, let's hope we see a few of them out and about in the near future. New model Francis Barnett Merlin. 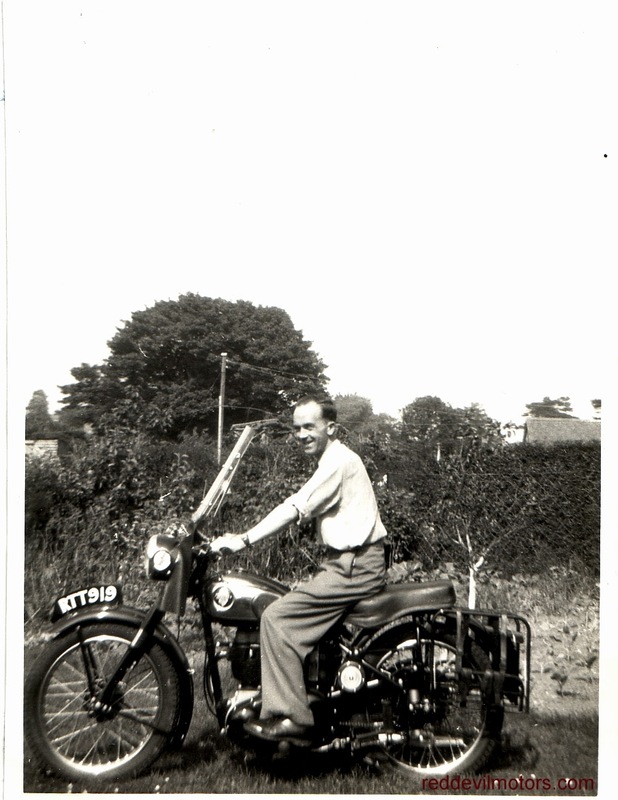 Period snap of proud owner with shiny and new looking BSA C12.